Courtesy photo A photo taken of Forest Service employee Josh Bransford posing with a trapped wolf on March 18 quickly spread across the web. Idaho's second wolf season closed in most zones on March 31, with hunters and trappers killing a total of 373 wolves this season. Two zones remain open to hunting only: the Lolo and Selway zones in Northern Idaho, both of which do not have harvest limits. Hunting will continue in those zones until June 30, though trapping has ceased for the season. The Idaho Department of Fish and Game reported that more than 43,300 tags were sold for the 2011-12 season. This year's hunter success rate was under 1 percent, despite more lenient rules that allowed hunters to kill two wolves per calendar year and use electronic calls and traps. The Southern Mountains Zone, which encompasses much of the Wood River Valley, closed to hunters and trappers in mid-February when the total wolf quota of 25 animals was reached. The 2012-13 season is set to open on Aug. 30 for hunters and Nov. 15 for trappers. Next season, hunters and trappers will be allowed to kill a total of 40 wolves in the Southern Mountain Zone. The new season also sets an increased bag limit of five wolves for each hunter and trapper, up from two this year, in six zones in the northern end of the state—the Panhandle, Palouse-Hells Canyon, Dworshak, Lolo, Selway and Middle Fork zones. One particular wolf trapped this season made headlines. Nez Perce National Forest Fire Management Officer Josh Bransford posted a photo of himself smiling in front of a trapped wolf in Northern Idaho. The wolf was pacing in a circle of blood-ridden snow. According to a now-removed post on www.trapperman.com, an online forum for trappers, Bransford trapped the wolf on March 18, but when he arrived at the scene, the wolf had been shot and wounded while still in the trap—causing the blood. 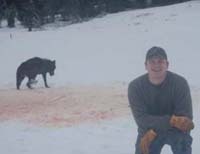 Bransford reported that he shot and killed the wolf after arrival, but not before posing with the alive and wounded wolf. New Mexico-based Center for Biological Diversity spokesman Michael J. Robinson said in a press release Tuesday that the trapping and subsequent nonlethal shooting and picture-taking constituted animal cruelty. "These photos make plain that the trapping and hunting of wolves being allowed by the state of Idaho are less wildlife management techniques than scapegoating of wolves," he said. "This egregious torture of a wolf needs to be investigated by Idaho's attorney general and the Forest Service." Staff at the Attorney General's office said the office has no jurisdiction over the matter and will not investigate. Idaho Department of Fish and Game spokesman Mike Keckler told the Missoulian newspaper that the incident had been investigated and that Bransford possessed all of the proper tags, attended a state-sponsored wolf-trapping class, was trapping on private land, had permission from the landowner and was checking his traps daily. He said investigators concluded there was no wrongdoing.